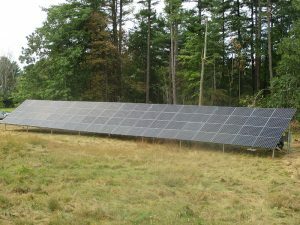 Mass Audubon’s decision to install solar energy systems at its 20 staffed wildlife sanctuaries was driven in part by the educational opportunities and environmental benefits presented by renewable energy. But as a nonprofit largely dependent on donations, membership fees and earned income, stabilizing operating expenses and locking in energy prices were major drivers, too. “We started accelerating our act in response to climate change issues around 2003,” explains Bancroft Poor, Vice President for Operations and Chief Financial Officer. 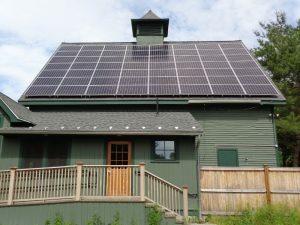 After focusing on energy conservation and efficiency improvements for several years, Mass Audubon turned its attention to renewable energy. The monetary impact of the solar installations is significant. For example, the 76-panel array on the Joppa Flats Education Center covers 99% of the site’s electric usage. That is equivalent to taking 4.4 cars off the road every year. With 42 solar energy systems now installed at 22 locations, more than 41% of Mass Audubon’s electricity comes from clean, cost-effective solar produced at the organization’s own sites. That’s estimated to be more than $75,000 off its annual electricity bill. Poor has watched solar installation prices drop in recent years. “At first, we were willing to pay a premium because it was the right thing to do. Today, the cost of installing solar is roughly half what it was in the beginning, making solar even more compelling,” he says. A half million people, plus 11,000 summer campers, visit Mass Audubon facilities each year, so the impact of visible solar energy arrays as teaching instruments is enormous. “People know we’re a nonprofit organization, so solar on our buildings sends a message that this technology is affordable and accessible, as well as effective for reducing our carbon footprint,” Poor says. What’s next for Mass Audubon’s visionary climate change agenda? Trying to achieve “net zero” energy-use status at its sanctuaries. No doubt they’ll succeed.